Flooding along the East River waterfront on the Lower East Side as Hurricane Sandy barreled toward New York on Monday, Oct. 29, 2012. MANHATTAN — The low-income communities of the Lower East Side and the Rockaways both suffered extensive damage from Superstorm Sandy four years ago. But advocates on the Lower East Side were able to engage more effectively in post-storm resiliency efforts than their counterparts in Queens because they already had a robust network of community activism in place from years of fighting gentrification, according to a recently published study from the John Jay College of Criminal Justice & the Graduate Center. 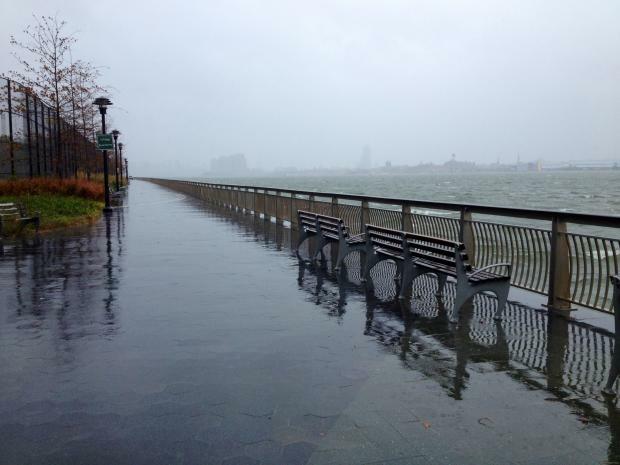 Researchers focused on the role of community organizations and being able to respond to the “climate change politics” of the city, which is increasingly important as the frequency of storms is expected to rise along with rising sea levels, noted Leigh Graham, John Jay environmental psychology professor and lead author of the study. While both areas have high concentrations of public housing residents and low-income households, the Lower East Side’s pre-existing civic infrastructure of community based organizations and social services fighting against development pressures enabled residents to recover more quickly, according to researchers who spent six months interviewing community groups in the area and 18 months in the Rockaways. The Rockaways, on the other hand, were at a disadvantage, not only because the area is more geographically isolated on the far edge of the city, but also because it’s more racially and economically segregated. There’s a high concentration of poverty along the eastern part of the peninsula where the residents have suffered from decades of economic “malaise,” which in effect weakened and undermined their post-storm response, researchers found. Community groups on the Rockaways did not have the same level of organization prior to the storm and remain more focused on meeting present economic needs than on pursing long-term resilience planning, she noted. “They were really dealing with economic stagnation and hardship that only worsened after the storm,” Graham said. Also, Rockaway residents have long been more aware of their precarious position surrounded by water and may not have been as surprised at being hit so hard by the storm as Lower East Side residents — which also may have affected response efforts. Though Graham found that mobilization around resiliency lags in Rockaway as residents struggle with more immediate economic concerns, she is continuing to do research there and has been seeing changes. The nonprofit Community Voices Heard is focusing on the climate change movement in the area, creating an organizing hub in Rockaway. The city is also investing $91 million into a revitalization plan for the area, and the Citywide Ferry is expected in a year. Graham is hopeful these dynamics prop up the foundation of resilience work since, she said, storms and flooding will only continue. “We know this is our new normal,” she said.